If you are hosting your wedding in one of Thailand’s private villas, you are free to personalise the décor theme as much as you like and there are plenty of easy ways you can add some colourful Thai influences to your theme and scheme. One of the true delights of hosting your wedding in one of Thailand’s plush private holiday villa rentals is the limitless freedom to plan a completely customized celebration. With the help of your dedicated wedding planner, you can arrange everything from the food to the décor just the way you want it, and if you are particularly inspired by the colours of the Kingdom, then you may want to try and reflect this in your unique wedding décor scheme. Below are a few ideas on to how achieve a distinctive Thai feel and how you can get your guests snapping endless photos of your centrepieces, backdrops and table decorations. Wherever you go in Asia, you will notice that the décor is often inspired by the colours of nature and is put together to create a soothing, tranquil ambience. Thailand is no different, and if you are celebrating your big day in one of the Kingdom’s private villas, you will alreadt have a great base to build up on. To fashion an authentic Thai décor scheme, focus on gentle understated colours including creams, white and light blue. You can brighten this up with a pop of colour later on, but it’s important to get your foundation right first if you want to create an elegant ambiance. If your private villa has any outdoor water features, then make the most of them. Bringing water to the fore is a wonderful way of striking a harmonic, far eastern feel, and it's relatively easy to do. Swimming pools, ponds and even running water features can be included in your theme. 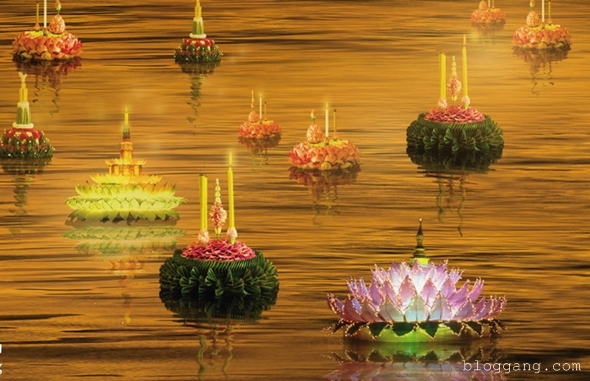 Draw inspiration from Thailand’s very own festival of light, Loy Krathong, when people release decorative lotus flower boats containing candles onto the water to bring luck. You can do the same on your wedding way, giving outdoor areas a soft, candlelit ambience as your unique Krathongs bob up and down on the water. The key to a successful wedding décor theme is selecting something that will last throughout the daytime celebrations and into the small hours when all your table decorations have been cleared away to make room for the party. 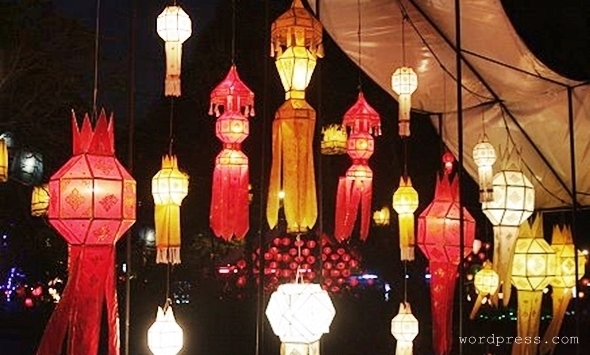 To make this happen, your lighting needs to be just right and you can transform simple lights into eye-catching decorative features by hanging a selection of stylish paper lanterns around the property. Not only will this guarantee the perfect ambient lighting scheme, but it will also introduce a splash of colour into your evening décor. If you’re planning to do things the Thai way, then your décor won’t be complete unless you hang a few floral garlands in your villa. 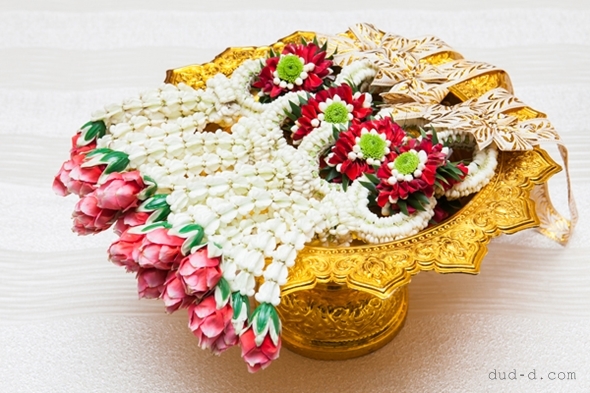 Handmade floral gardens are used in a multitude of Thailand’s spiritual and religious ceremonies. Made from jasmine, the flower garlands will look great as decorations to hang on the back of guests’ chairs during the ceremony and will also give off an irresistible floral aroma. If you are after something a little more extravagant for your centrepieces, orchids – possibly the most elegant flower there is – also happen to be the national bloom of Thailand. Thanks to selfie love, no wedding is complete these days unless you add some kind of photo booth. 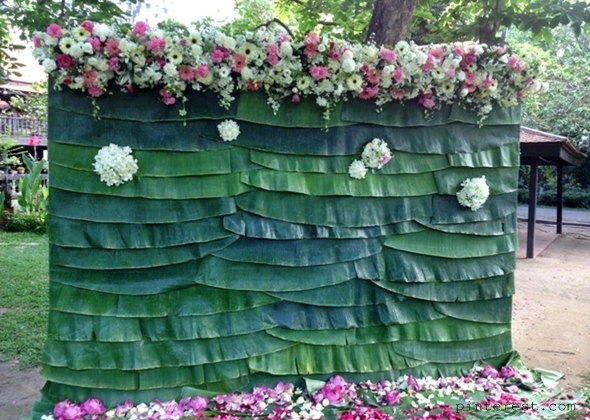 With style guidance from your wedding planner, you can make your very own Thai-themed photo backdrop. 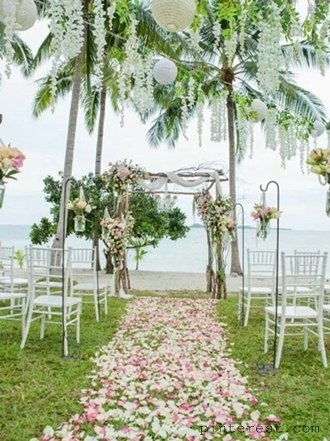 Bamboo will make for an attractive and sturdy frame to be decorated with palm leaves and flowers of your choice. Frangipanis, jasmine and lotus flowers are all flowers that will give a traditional Thai element and a colourful twist. You could even put up a banner with the your names on the photo booth, but have them written in Thai script rather than Roman lettering.